Kaikōura's much-loved crayfish caravan Nins Bin is making a comeback just in time for summer. 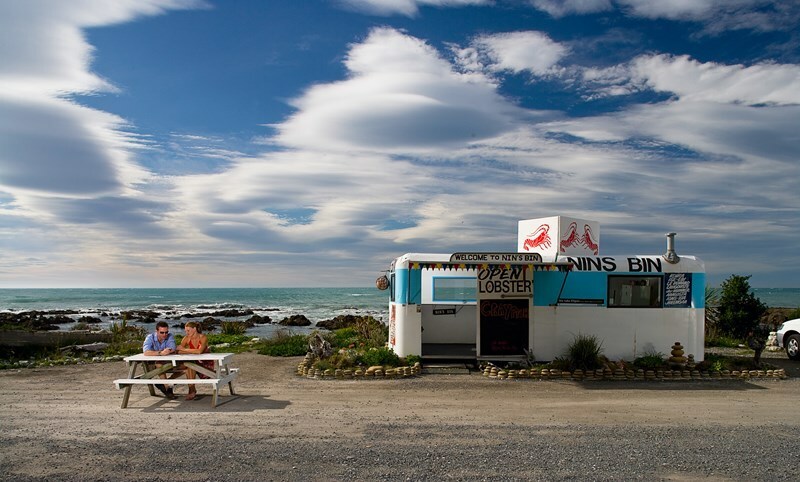 The well-photographed seafood vendor has been a favourite stop along the Kaikōura coastline for generations. Nins Bin closed after a major earthquake cut off access to State Highway 1 north of Kaikōura in November 2016. Now, the blue and white roadside caravan is getting a spruce up ahead of its planned reopening on December 15 – the same day SH1 reopens for daylight travel. “She’s all the same – just looking one million times better,” says Nins Bin co-owner Johnny Clark. "She got neglected for a while. Nins Bin has been owned and operated by the Clark family since the 1977, when Johnny’s grandfather set it up. The caravan is named after a lady who used to work there. Johnny, 23, has helped his father Rodney with the business for nine years – a lengthy apprenticeship. Now it’s his time to shine. The caravan will be in the same location as before – 20 kilometres up the coast from Kaikōura – but there’s a lot more beachfront now. Johnny says the land lifted 3.5 metres in the quake. The menu will include mussels from the Hairy Mussel Co in Marlborough, whitebait and crayfish straight from the sea. Catching the crays will be “just me and my deckhand Big Fletch”, Johnny says. Johnny shared the news of Nins Bin's reopening on Facebook this week and the post received congratulations from as far away as Texas. “If you sell beautiful food, everyone talks,” Johnny says. The opening hours will mimic the opening hours of SH1 – check here for updates. Kaikōura means “to eat crayfish” in Maori (kai – eat/food, koura – crayfish).